Welcome back to Bias Month here on Cucicucicoo! 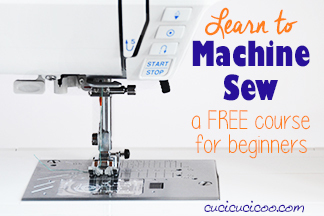 This month I’m writing a bunch of lessons and tutorials on how to use bias for better sewing. Here is the full list of the Bias Month technical lessons and practical tutorials to practice the techniques on. Just click on any of the links to check them out! 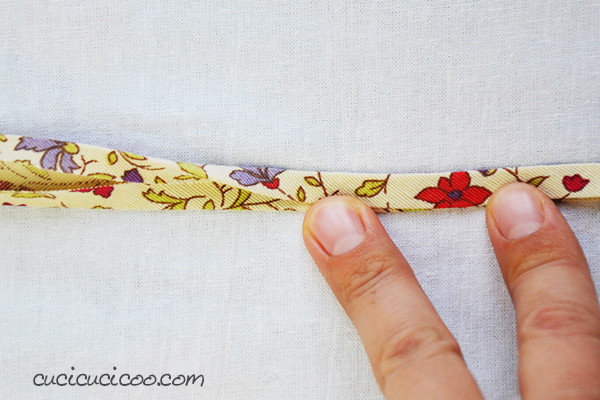 Last time I showed you what bias is and how to make short bias strips and bias tape. 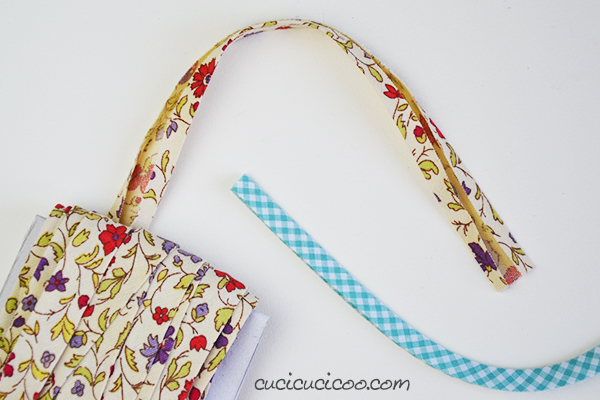 This week I’m going to show you how to make longer strips of bias tape with a bias tape maker. Bias tape makers come in various sizes. They make single fold bias tape, so the size given is the width of the single fold bias tape from one fold to the other. 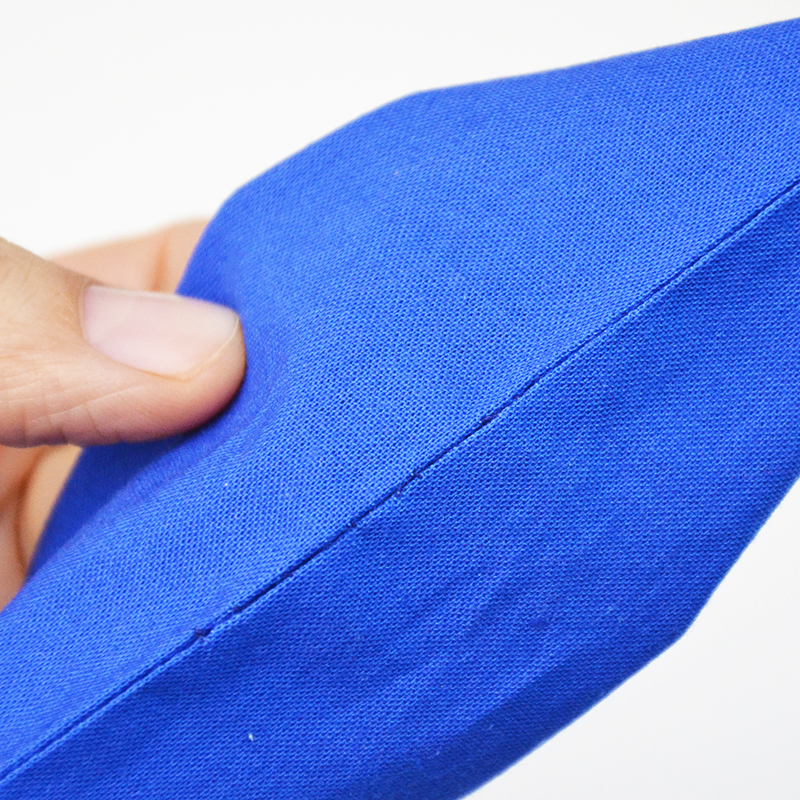 If you need double fold bias tape, you simply fold the single fold in half, which means that the double fold is half as wide. Therefore the Clover 18 mm bias tape maker* seen above makes 18 mm (3/4″) single fold bias tape and 9 mm (3/8″) double fold bias tape. 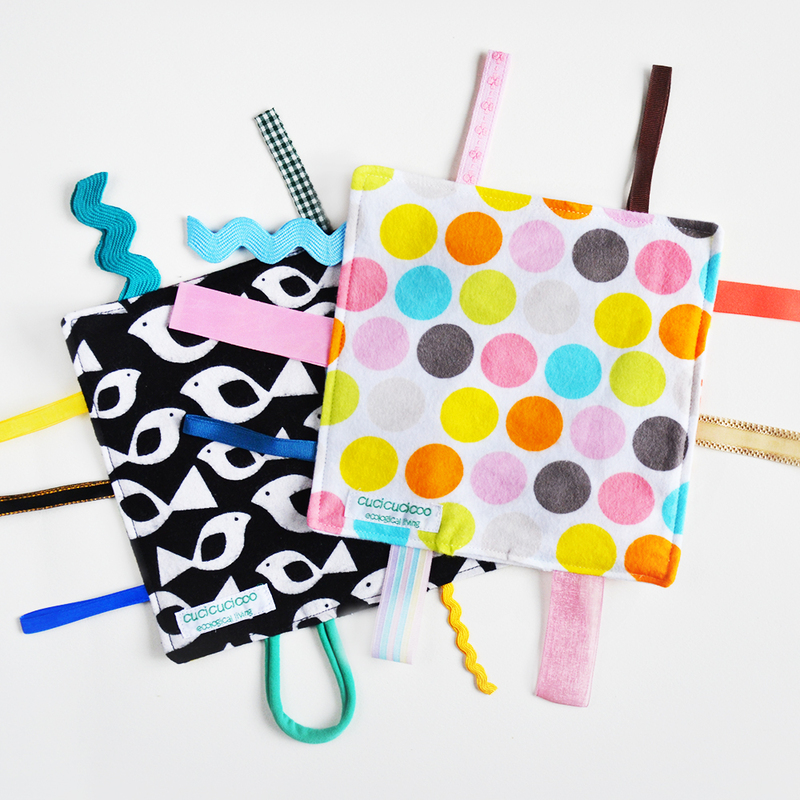 I highly suggest purchasing a set of bias tape makers in different sizes* so that you will be prepared for any project. Let’s get started making our bias tape! 1. 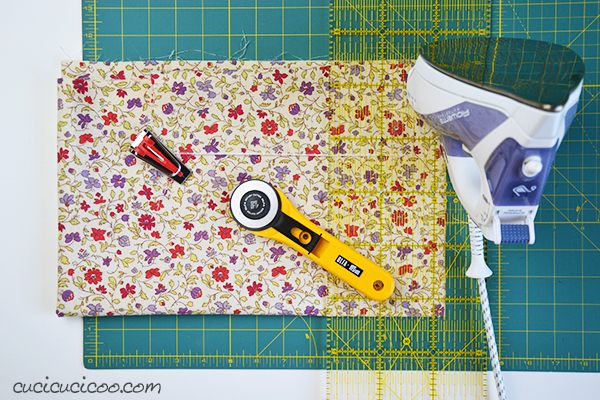 Position the fabric on the cutting mat* so that you can make cuts at 45°. In this post I’m showing one way to position the fabric (lining up the fabric with the grid and cutting along the 45° line), but I personally find the way I showed last time to be easier. I suggest trying both to find which you prefer. 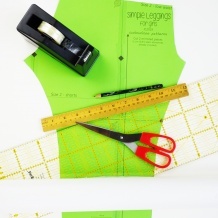 Make the first cut with the rotary cutter* (top). 2. The strip needs to be twice as wide as the bias tape maker’s size. So for my 18 mm (3/4″) maker, I need to cut 36 mm (1 1/2″) wide strips. So I moved my quilting ruler* over so that the first cut lined up with the 36 mm line on the rule. Ok, so there is no 36 mm line. I just eyeballed about 1 mm beyond the 3.5 cm line. Make your second cut (bottom). 3. 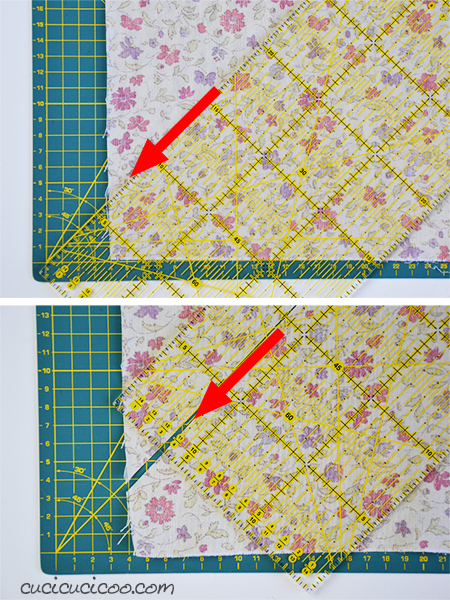 Continue to move the quilting ruler over so that the previous cut lines up with the 36 mm line, and make another cut. … and contine to make cuts at the necessary width. Cut as many strips as you want. If you cut the strips from a rectangle, the strip ends will be at 45° angles. 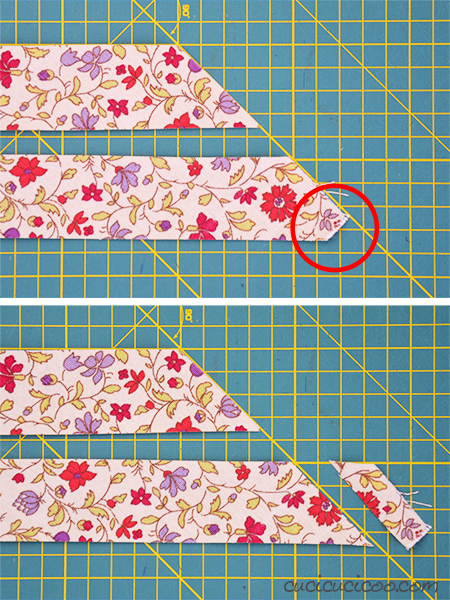 If any of them have an end that is not a perfect 45° angle (such as the one circled above), just line it up on the cutting mat and trim it off (as seen on the bottom). 1. 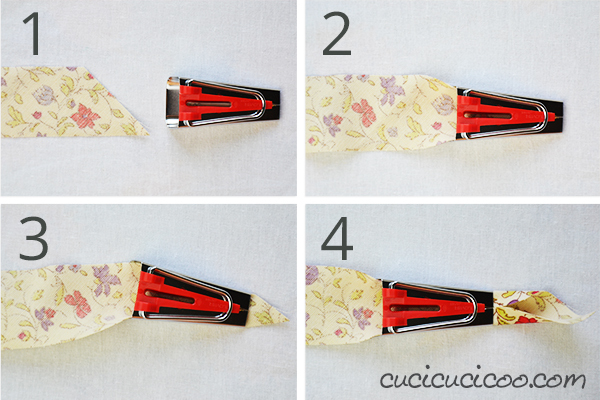 Start with two strips with ends that are angled in the same direction (top). Flip one wrong side up and line up the angled edges as seen at the bottom. Do NOT line up the very tips! 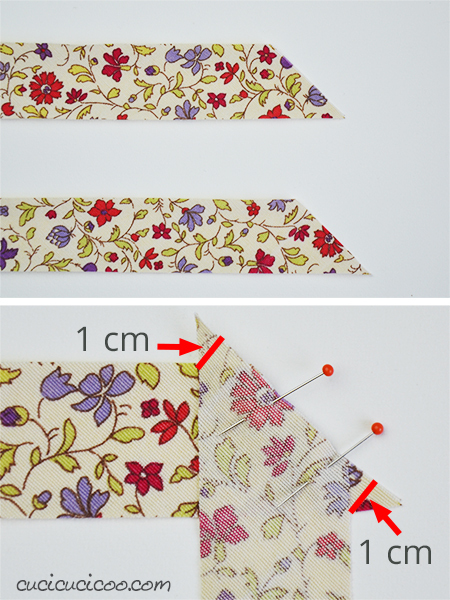 They need to stick out so that there is 1 cm (or whatever seam allowance you are using) between the angled edge and the point where the other strip meets the straight edge (shown above by the red lines). 2. Sew the strips together at the chosen seam allowance, so in my case 1 cm. Notice how the stitching goes from one corner formed by the two strips across to the other corner. This method may not make much sense to you, but when you flip the strips right side up, you’ll see that they match up perfectly! 3. Continue joining each strip to each other until you have one long strip. First prepare your long fabric strip. Heat up your iron at the highest heat and steam setting possible. Iron open each seam on the wrong side of the fabric (top), then trim off the little tips that stick out over the edge (bottom). 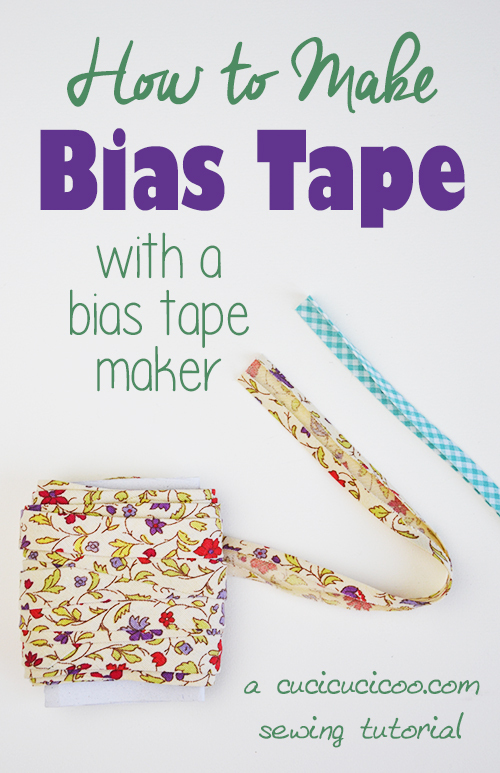 Let’s take a look at the bias tape maker. On the left above you can see the end where the tape comes out, nice and flat. On the right, you see the wider end where you feed the fabric in. The little handle is to hold on to so that you don’t burn your fingers with the iron. 1. 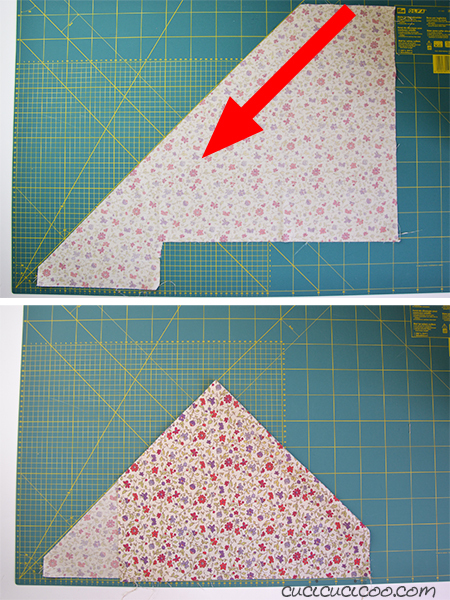 Find the angled end of the bias strip and lay it flat on the ironing board, wrong side up. 2. Slide the end into the bias strip maker as far as it’ll go. 3. Stick a pin through the long slit at the top of the maker to push the fabric through enough so that the very tip is sticking out. 4. Pull the end of the strip out enough that you can straighten it out and hold onto it. 5. 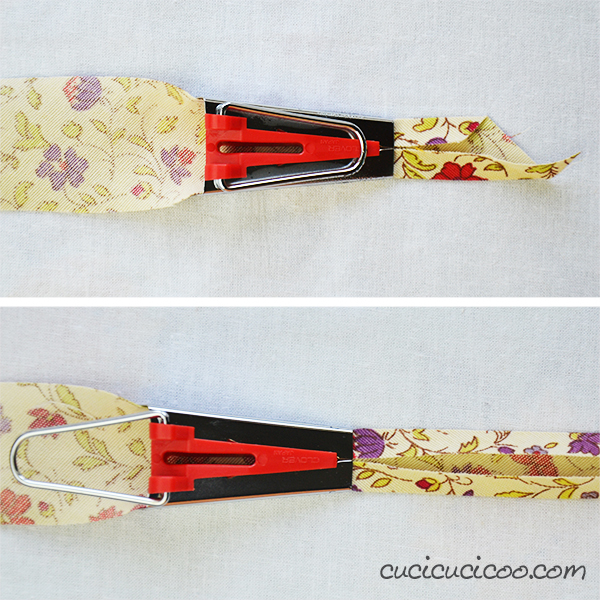 Iron the strip as you pull it out of the maker to heat press the folds over. 6. 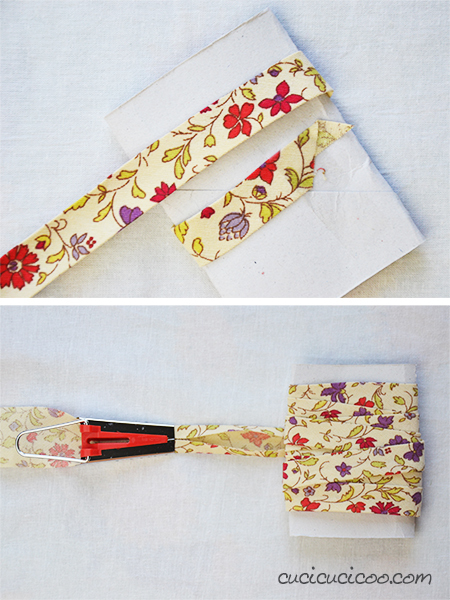 Use the handle to pull the bias strip maker to the left, ironing as you go. I highly suggest NOT dragging the iron, but picking it up and placing it back down. 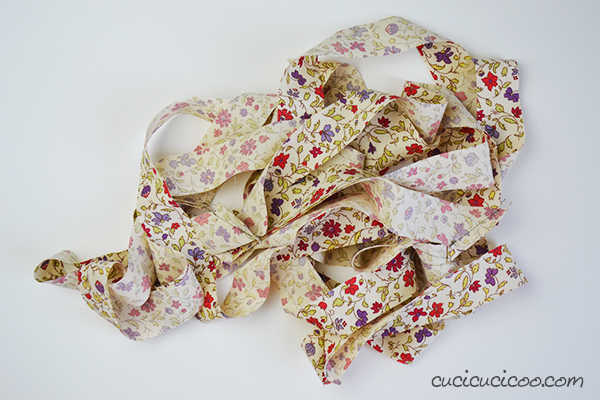 Dragging it can stretch the bias tape out of shape or create deformed folds. This is how I iron the bias tape: I place the iron on the first bit of bias tape, right up to the maker. With the iron still down, I pull the handle a little bit to expose more bias tape. I pick up the iron and put it immediately back down on top of the newly exposed tape. Continue this way until you have at least 15 cm (6″) of pressed tape. At this point I tape the end to a flattened toilet paper tube and start winding the bias tape around it. 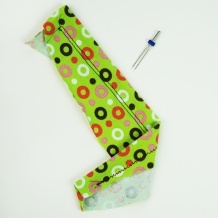 As I iron more bias tape, I continue to wrap it around the tube. This not only keeps the bias tape orderly and ready to be stored, but also keeps the newly ironed tape flattened so that the fabric can cool down with the folds in place, helping them set. 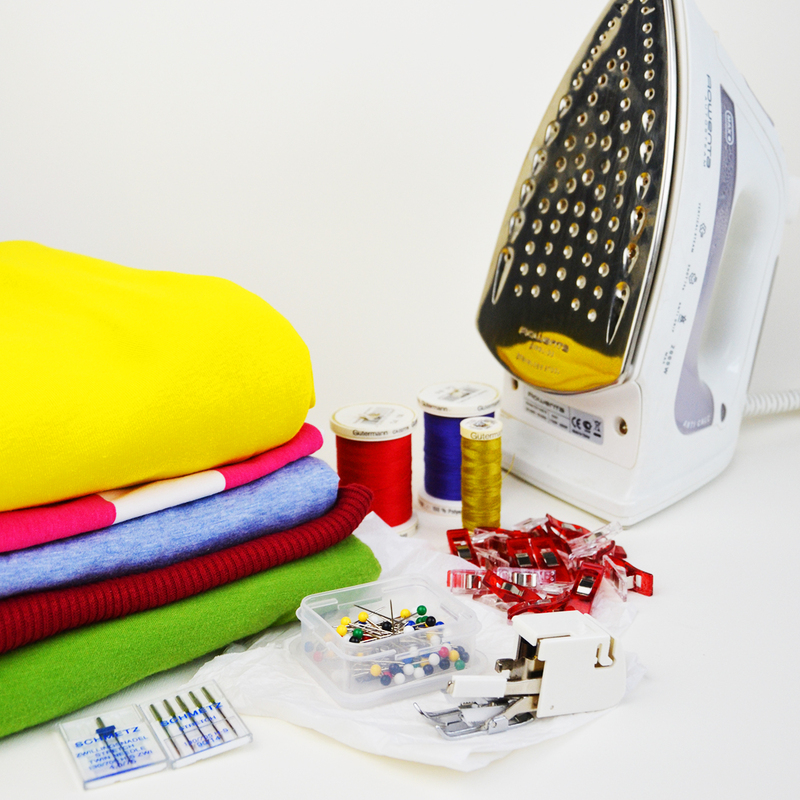 Continue this way until you’ve ironed the entire strip of fabric. Tuck the end under the other layers to hold it in place. Isn’t that pretty? 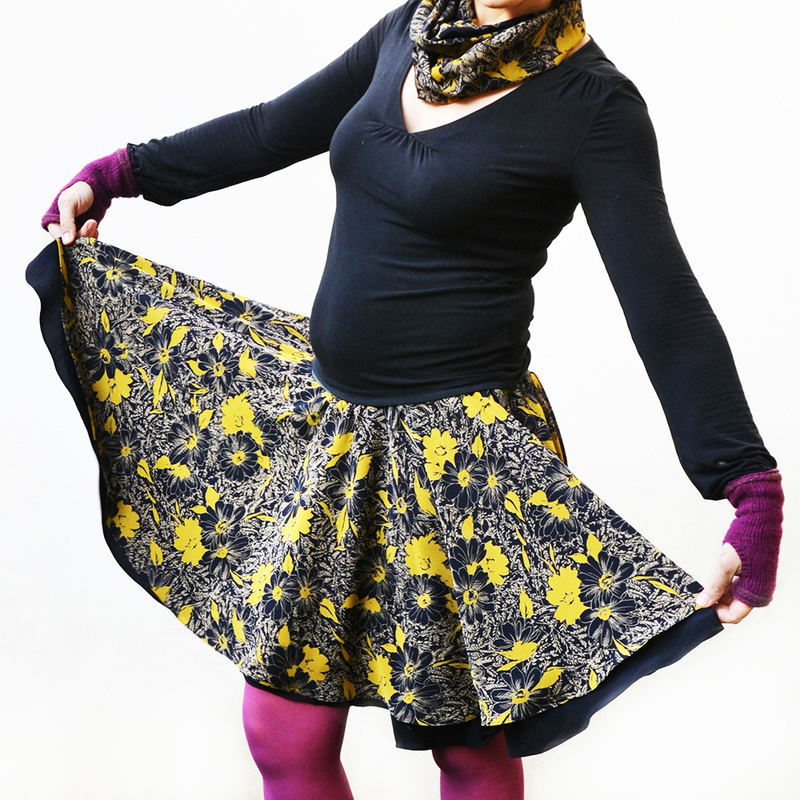 This was a fabric that I never liked that much, but I much prefer it as bias tape! This process makes single fold bias tape (on the left). 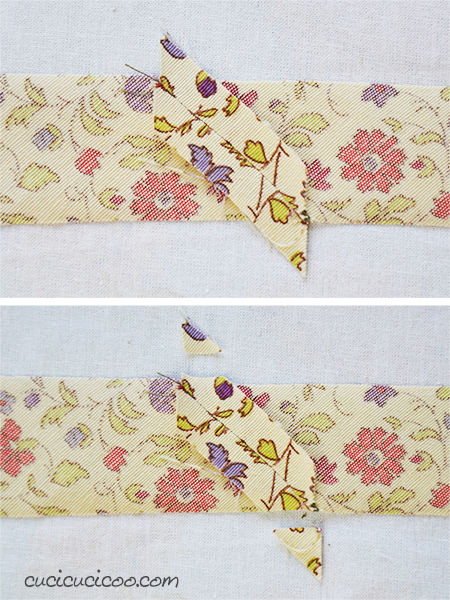 To make double fold bias tape (on the right), you have to fold it in half. 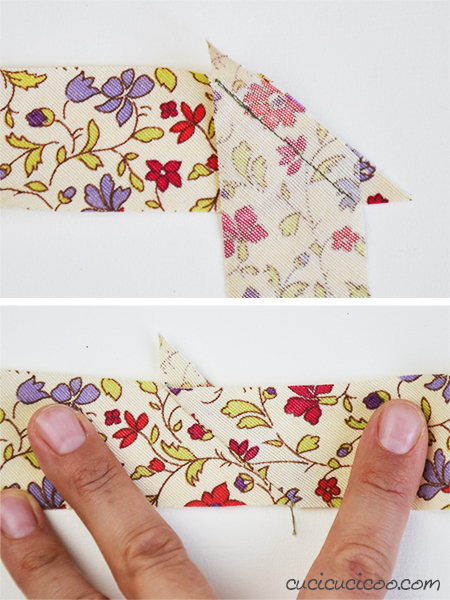 To make double fold bias tape, fold the single fold bias tape in half lengthwise and iron it flat. 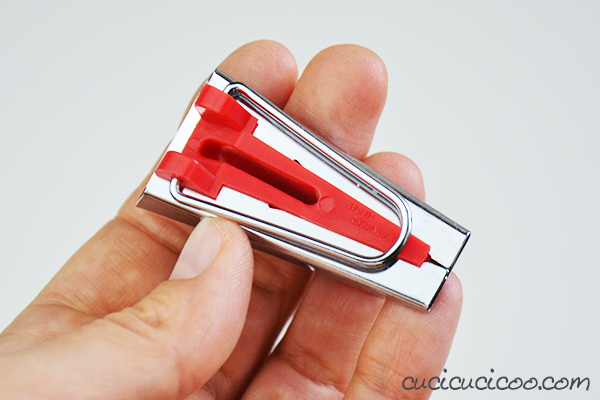 If possible, fold it so that one side is slightly longer than the other, even just 1 mm. 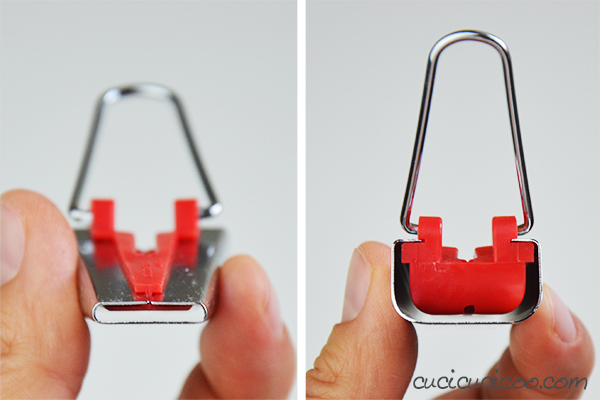 This makes it easier to sew clean bindings. Ta da! Now you have bias tape all ready for your next project! 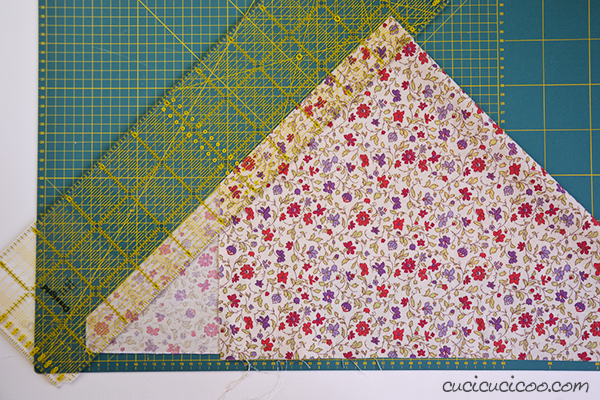 I will show you a trick in another tutorial for turning a square or rectangle of fabric into a TON of bias tape without having to keep matching up the angled ends. 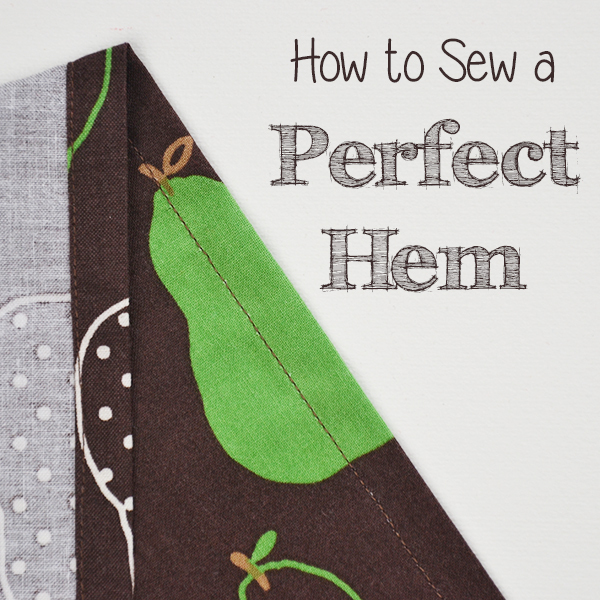 But the technique that I’ve showed you today is great when you’re making bias tape out of odd-shaped or smaller pieces of fabric. 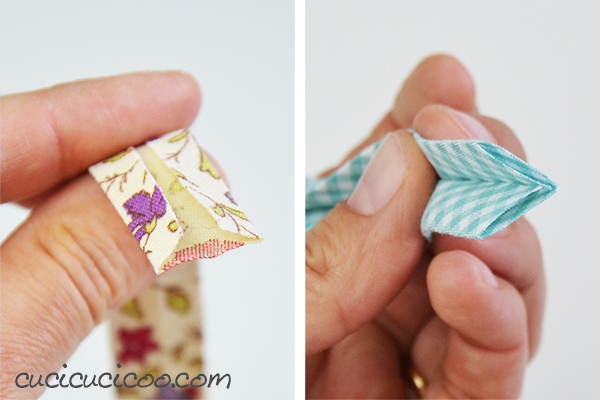 Come back in another few days and I’ll show you how to start sewing with double fold bias tape! Yah! 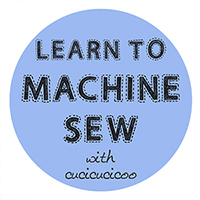 This lesson on how to make bias tape with a bias tape maker is part of the Cucicucicoo Learn to Machine Sew beginner’s sewing course! Don’t forget to share pictures of your work on Facebook or the Cucicucicoo Creations Flickr Group! 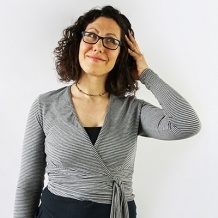 molto interessante…non sapevo neanche esistesse uno sbiecatore!!! 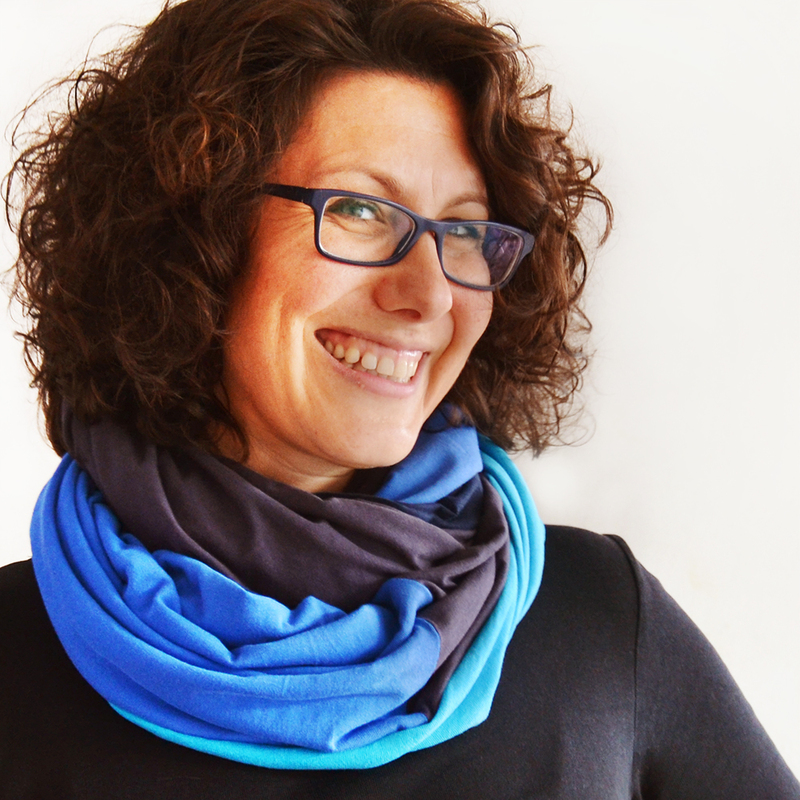 Bravissima Lisa bellissima lezione, interessante anche l’utilizzo del righello del pachowork con la base da taglio ……… ora ho capito a cosa servivano tutte quelle linee. Grazie Marea, in realtà uso la base da taglio in modo molto elementare. 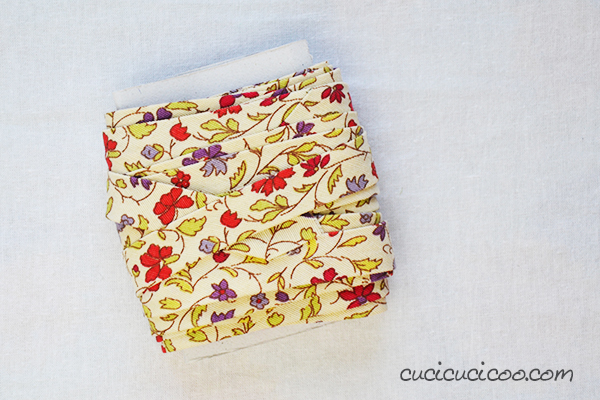 Chi fa il patchwork le usa tutte, ma onestamente non so neanche come! Ma per fare cose di questo genere, è comodissimo usare questi strumenti! Dove posso trovare lo sbiecatore? 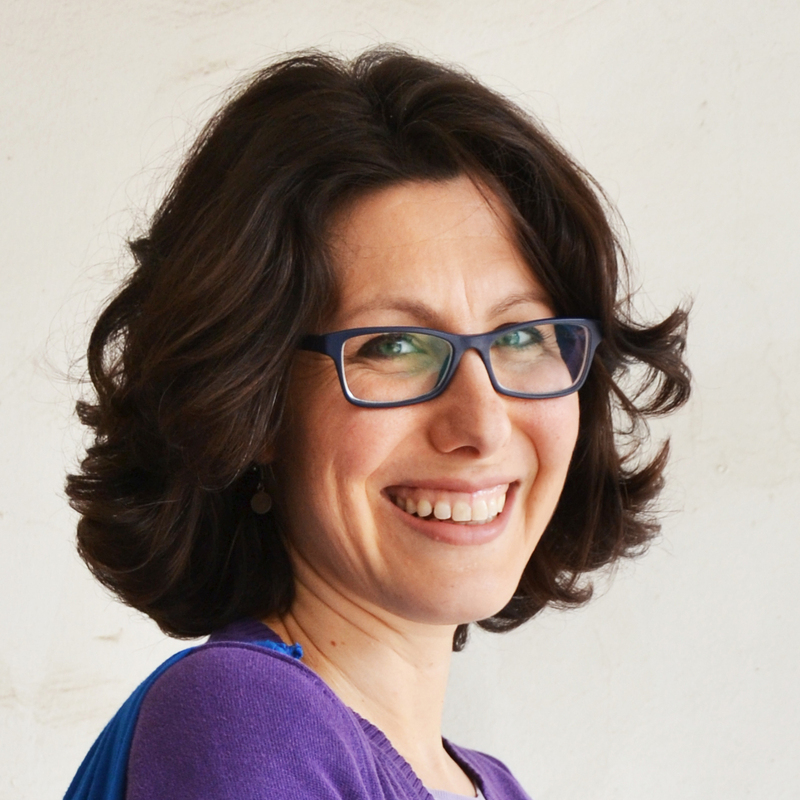 Ciao Luisa, si trova lo sbiecatore nei negozi dove si vendono altri strumenti per il cucito, quindi mercerie, negozi di tessuti, negozi per macchine da cucire. Se compri le cose online, ti consiglio di comprare un set online, così avrai più dimensioni e costeranno di meno. Ci sono marche che costano di più, ma ti dico onestamente che mi trovo stra-bene con questo set di 4 sbiecatori di marca sconosciuta che ho acquistato su Amazon: http://amzn.to/2pVR2Vp ! I’m looking for a bias tape maker for a 2 1/2 ” strip of material. Hi Ruthie, I’m afraid that I’ve never seen a bias tape maker for that size. This Clover set of bias tape makers are the standard sizes. If you have a 2.5″ strip, you’d need a 1 1/4″ bias tape maker, but as far as I know, they exist in 1″ or directly 2″ (in addition to smaller sizes). Bellissimo lo sbiecatore, ma, anche se ho piedino per lo sbieco, io preferisco cucire lo sbieco aperto. Il risultato mi sembra più preciso. È sbagliato cucire lo sbieco aperto? Una volta finito e ribattuto sta bene ed é più solido. Non mi dono spiegata. Scusa. Oops, mi dispiace di non aver capito! !